We all know life can be unpredictable, which is why D&G Carpet Cleaning offers 24 hours a day, seven days a week emergency services for water damage in your home, car, boat or RV. D&G Carpet Cleaning's certified and experienced technicians will work with our advanced carpet care technology to deliver quality results and great service. Flooding, either by an act of Nature or a leaky faucet, is one of the most troublesome things a homeowner can deal with in the life of their carpet or other floor coverings. Each flood is different, and consequently, the ways of treating water damage vary from case to case. Before treatment can begin, questions must be asked and the situation fully evaluated for the extent of the damage and to find the best treatment process. The most important part of treating your flood damage is determining the type of water intrusion: black water, sanitary or unsanitary. A black water flood consists of water that contains any form of raw sewage. Sea water and groundwater may also be classified as black water because they are in contact with the ground, and therefore possible sewage contaminants. Black water flooding is potentially hazardous to your health and the health of your home. In order to properly deal with this type of water intrusion, the building must be evacuated and all flooring materials disposed of so as not to endanger health. Usually, all porous surfaces are evaluated for discarding if they are deemed to be unsafe. Workers must wear protective gear and clothing and not come in contact with materials soaked with the black water. Though most homeowners have their carpet replaced after a case of sanitary flooding, replacing flooring is usually not necessary. Once the source of the flooding has been controlled, any furniture or objects that could stain the carpet are removed, and the water extraction process begins. After extracting the excess water, a disinfectant is applied to the carpet to kill any possible germs, and then the carpet is left to dry. Make sure to keep traffic on the wet carpet to a minimum; too much and the carpet may become unstuck from its backing. In order to keep the carpet clean and mold and bacteria free, it should be removed from the tacks while drying and the padding underneath the carpet removed. Any type of water intrusion that may contain biological contaminants can be classified as unsanitary water, such as an overflowing toilet or dishwasher. If the carpet is decided to be too unsanitary to keep, it is discarded. If it is salvageable, disinfectants must be applied in order to ensure safety and health of the occupants in the living space. Workers should wear protective clothing and gear when cleaning and disposing of materials involved in an unsanitary flood. 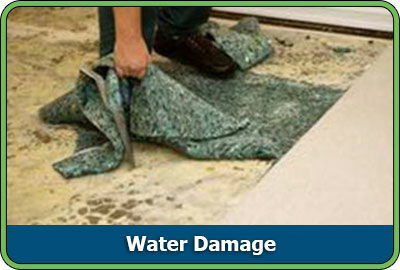 Be quick and careful when dealing with an unsanitary water intrusion; if it is left too long, the unsanitary water may become black water, and the carpet or flooring must be replaced. D&G Carpet Cleaning offers "green" and organic products for carpet care approved by the Rug & Carpet Institute, so you can trust you will always get great results when you use D&G Carpet Cleaning. Call today to receive your free estimate from D&G Carpet Cleaning, because customer satisfaction is guaranteed.